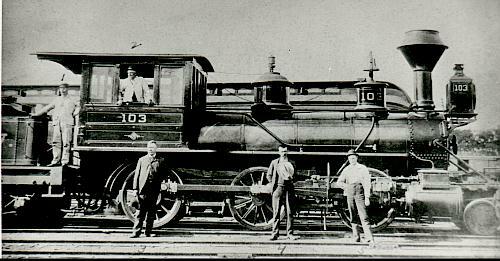 The New York, Ontario & Western Railway was incorporated in 1882 to succeed the bankrupt New York & Oswego Midland Railroad. The railroad ran from Cornwall on the Hudson River to Oswego on Lake Ontario, with branches to Kingston, Port Jervis, Monticello, Delhi, Utica, Rome, Scranton, and an ill-fated branch toward Auburn. 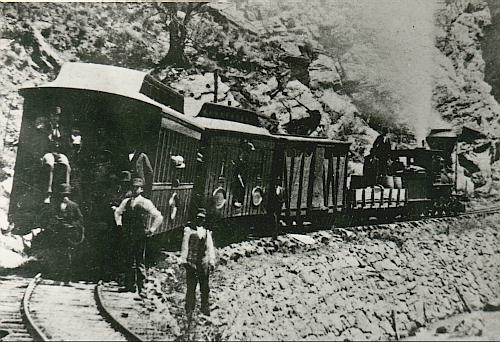 The O&W was the first major railroad to completely abandon. The last train ran on March 29, 1957. Here, a Midland train stops for its photograph at an unknown location. Judging by the rock work, it may be along the East Branch of the Delaware in the Catskills. Note the big stack on the engine and the freight on the flatcar. The coach and baggage car are truly 1860's vintage stock. Many locomotives purchased by the Oswego Midland lastest well into the O&W years. While the OM gave names to nearly all of its locomotives, the practice stopped before the change to the Ontario & Western name. Here are a few examples of locomotives that outlived their original owner. Engine #2, the "Madison," gleams in the sun as engineer Pat Fogarty stands in the gangway for his portrait. 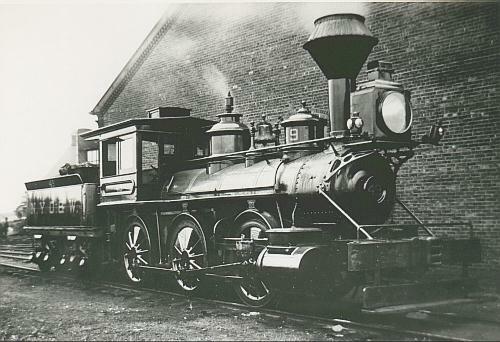 This engine was built by Rhode Island Locomotive Works in April, 1869 and sold in October, 1887. 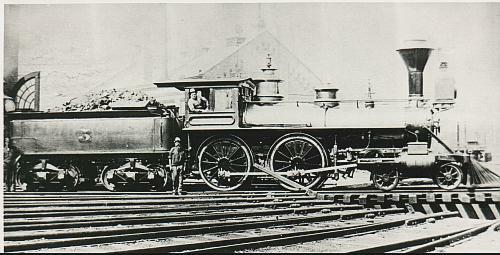 The "Sullivan," #5, is seen here on the Weehawken turntable, probably in the late 1880's. #7 was not really a Midland engine but came to the O&W in 1905 from the Port Jervis, Monticello & NY when the O&W bought the line from Summitville to Port Jervis. The sole resident of Class F, the 7 was in Middletown, apparently just before she was sold in 1916. The "Courtland," originally numbered 78 by the Midland, was built by Rhode Island Locomotive Works in September, 1872 as a 2-6-0. She became second 68 in 1873 and renamed the "Utica." 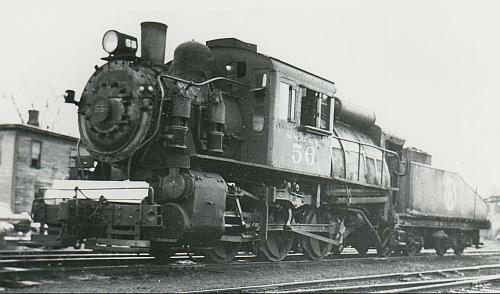 She was then rebuilt as an 0-6-0, seen here, and renumbered second 49. This view is probably in Middletown. 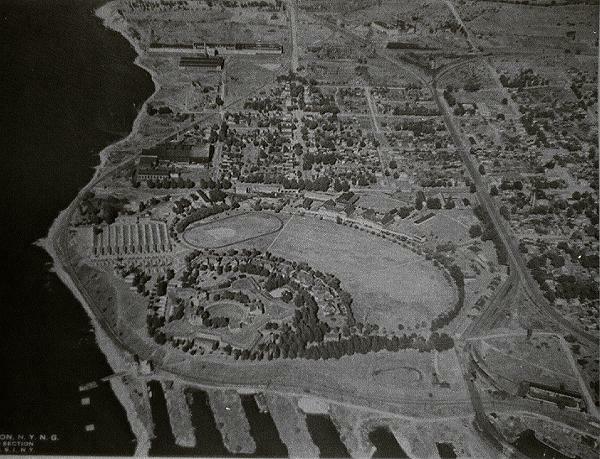 The 49 was scrapped in March, 1903. This Rhode Island product of 1873 was originally named the "Bloomfield" and was numbered 92. It was renumbered 103 in 1888.